When my husband and I met Barry and Pam Soorenko a few years ago while vacationing in Asheville, North Carolina, one of the things Barry and I talked about when the four of us went out to dinner together was our love for unusual ice cream flavors. I mentioned that my love for strange ice cream flavors began in NYC at Mario Batali's Otto where I ordered olive oil gelato out of morbid curiosity, not expecting to like it in the least. But at the moment of first taste, I discovered olive oil was now my new favorite ice cream flavor and that was the beginning of my experimenting with my own strange (surprisingly delightful) ice cream flavors. After I spent time gushing about olive oil gelato, Barry mentioned to me that his sister Susan owned a burgeoning ice cream empire in Maryland known as Moorenko's and that he would have to recommend she give olive oil ice cream a try sometime. I have been Facebook friends with Barry and Pam ever since we returned home from Asheville and every so often Barry would post something ice cream-related on my wall after perhaps reading of some unusual homemade ice cream I had concocted, but on the whole, I haven't really heard from either of them since our dinner together in Asheville. That changed about two weeks ago when I received a message from Barry asking for my address because he wanted to send me some Moorenko's ice cream. It was at this moment that I realized why Christmas gifts stress me out so much: because they're something everyone expects. The best gifts, the true gifts. come out of nowhere, when you're not even expecting them. Barry knew how much I loved ice cream, he knew I take great pleasure in making my own ice cream and decided to share the love with some of his sister's own ultra-premium, fancy-flavored ice cream. I was in ice cream heaven. I have since sampled from each container and have deemed the honey lavender the most heavenly for the simple fact that, as is the norm with me, it is the most unexpected and unusual flavor of the lot. You don't expect your ice cream to be floral, but the sweet and the creamy pairs beautifully with the floral notes of the lavender. If I close my eyes while eating this ice cream, I might swear I was strolling through the lavender fields of Provence in late spring/early summer. Even though honey lavender was my favorite, all six flavors were delicious and each container had the perfect creamy, luscious texture one would expect out of a high-end, ultra-premium ice cream. 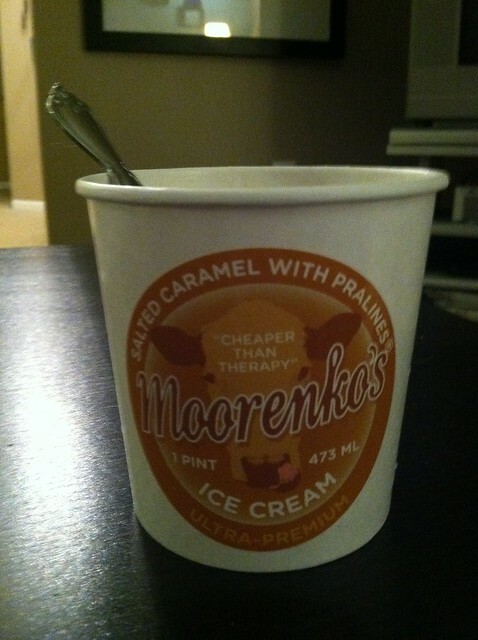 The only thing that a connoisseur might contest is Moorenko's appears to be a bit stingy with the mix-ins. Whether it's chocolate chips or pralines, the mix-in landscape is not very fertile. However, I actually found this to be an advantage rather than a setback. I'm someone who prefers my ice cream to be smooth instead of "rocky" and I like to savor it slowly. If I'm spending more time chewing, that takes away from experiencing the actual ice cream base. Large chunks of mix-ins are a distraction from the master's craft. They prevent you from tasting and experiencing the pure, artisanal ice cream. 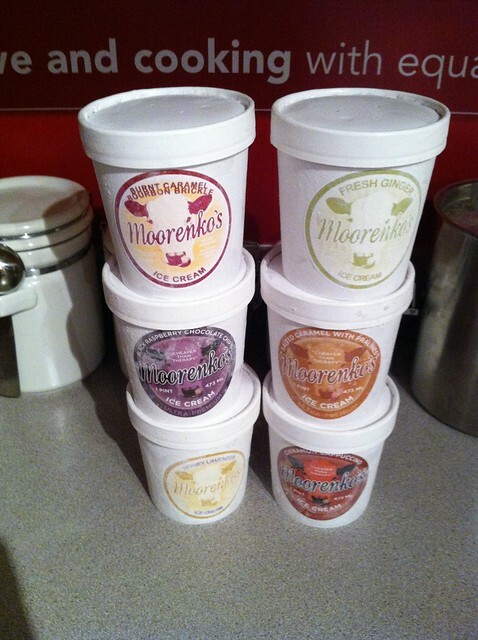 After getting the opportunity to experience Jeni's Ice Cream this past summer, I'd have to say that Moorenko's is definitely in the same league as Jeni's. The texture is perfect and the flavors are sublime. I feel like I received an ice cream windfall in 2012. I wonder what delicious surprises await in 2013. Just this evening, before I finished this post, I polished off the entire carton of salted caramel with pralines almost completely by myself. My husband contributed by maybe having 4 or 5 bites. If this is cheaper than therapy, I just got my money's worth! How nice of you to share those 4 or 5 bites! LOL. Wow! These ice creams do sound heavenly. I'm not sure which one would have been my favorite because they all sound fantastic. Maybe the cappuccino, or perhaps the ginger. No, wait! I mean raspberry chocolate . . .
Oh my, I am drooling as I read your post! Salted caramel with pralines - yum! 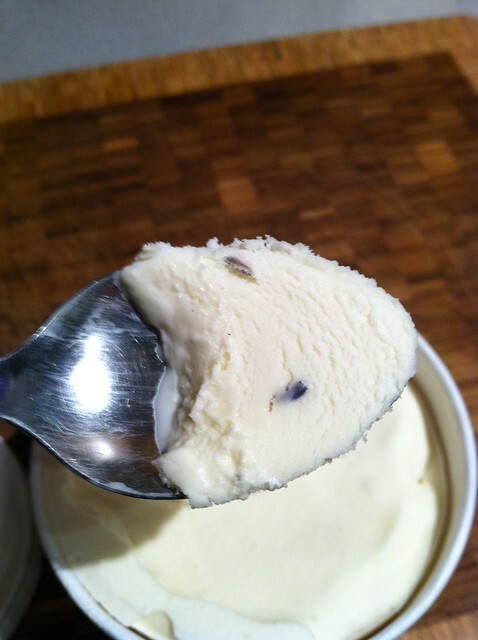 Honey lavender ice cream? I had no idea there was such a thing and now I MUST have it. What a fabulous surprise and wonderful discovery - thank you for sharing it! Ok, you have me drooling now. Hope you have a fabulous New Year. Ok, now I know what I'm going to have for lunch! Beth, thanks for the wonderful review! If I had to choose my favorite of all of my ice creams, I think it would be the Chocolate Chip, which is actually a straccialla (look it up). Our wonderful vanilla with melted bittersweet chocolate swirled in. Regarding the mix-ins (inclusions as we call them), I feel as you do. I'm the one making the ice cream, not the chips. The inclusions are much less expensive than the ice cream ingredients, so using a lot of them to displace the ice cream is a great way to increase the profit margin. Silly me! Strange as it sounds, Honey Lavender is our third best seller after Salted Caramel and Ginger. For any of you who would like to get some for yourselves, just shoot me an email and we'll make it happen! susan@moorenko.com. Happy New Year everyone! Only eat the good stuff! I am not a huge ice cream fan, but I don't think I could resist these! I would love to try the honey lavender. I'm like you, I love to try different flavors instead of the more "normal" ones. Those sound divine! I'm looking at the black raspberry chocolate chip and the burnt caramel bourbon brickle as likely favorites, but, from your description, I could imagine honey lavender taking the lead. 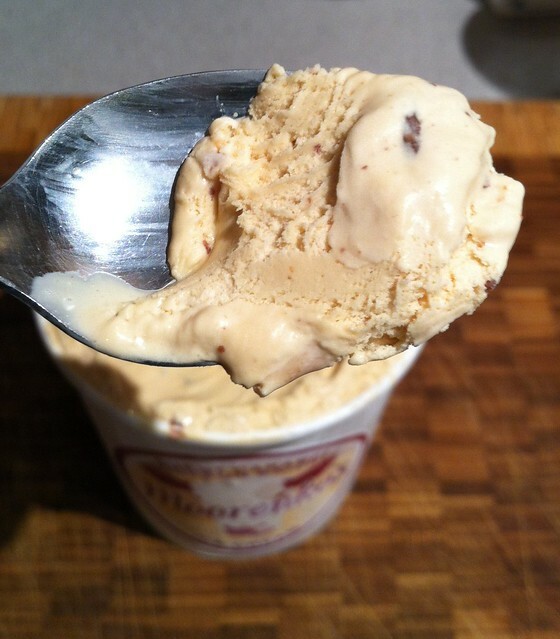 Honey lavender and especially cinnamon cappuchino sound like wonderful ice cream flavors. I normally stick to plain vanilla(I know, not always the most adventurous eater! ), but those are two flavors I definitely want to try now. wow, that is a nice gift!! Stop it! I'm drooling. The honey lavender and the burnt caramel bourbon brickle sound most divine. That's was such a nice gift! I would have cleared out all the other stuff from my freezer to make room for those babies! Thanks for sharing the experience with Weekend Cooking readers. I agree that the unexpected gifts are the best, what a lovely surprise. I think I would try the honey lavender and the salted caramels with pralines first.